What has happened to wall opposite Bell Square?!! It's part of the Christmas decorations. "Merry Christmas, Wall is over"
it beggers belief,unless illness is involved this driver shouldnt be on the road. 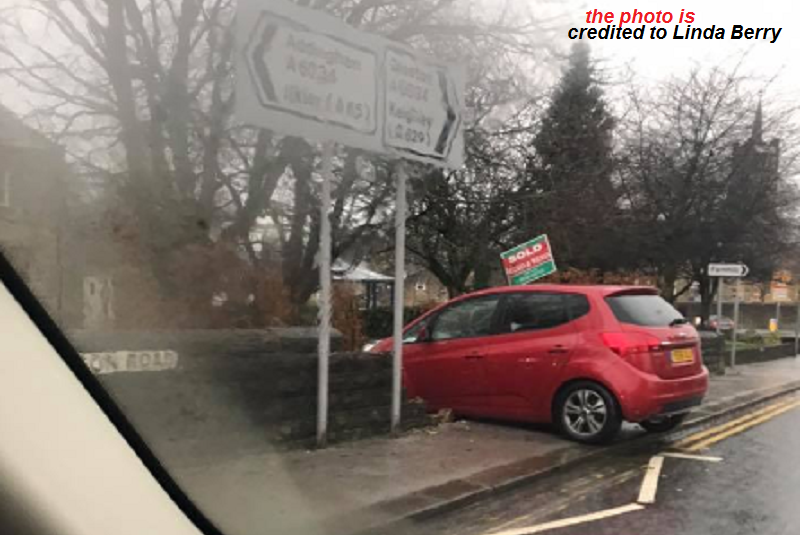 Although the signage is much better now, since the lights have been put in, this is still a very dangerous junction which should be approached with extreme caution. It would appear this incident could have been much worse if there had been someone travelling on Bolton Road, or worse, walking on the pavement at the time of the incident. .... and there are still accidents at this junction. A week ago I saw two cars parked on the side of the road, the drivers exchanging particulars. One car had a big scrape down one side and a bumper hanging off. I personally think the lights are in a dodgy place.Too close to junction. When turning out of Bell Square and watching traffic approaching from the right when turning left, you are straight onto the lights Accident bound to happen. ..mmm...funny..I wonder if Skippy is going to say something about this? maybe someone hit accelerator instead of brake? Do us a favour Corky Yorky, if you have a problem with Skippy, have a word with him in the real world, stop bitching on here. What you talking about TitleyDrinker..you need to lift your head out of your pint! Don’t have any problems with Skippy and certainly havent bitched abut him. At the Town Council meeting for placement of this crossing, which Skippy attended, it was suggested by a member of the public that it should be placed higher up the road, closer to the old folks home and better still to wait if the school got permission, because then it could be sited more appropriately!! It’s clearly that the siting of the crossing is currently causing issue!! So if it's the crossing that's the problem why were there still accidents before it was made? If our town main street was a 20mph zone just like Addingham then we would all be much safer. thats what i said on another tread,but with it being an A road through silsden they cant do it with out a school on the route,addingham have it as its main rd was down graded when the bypass was built ,so untill silsdens bypass is built its 30mph. I travel thru Silsden a number of times during the day and i can say that from 7.30am till after 6pm you will be very lucky if you go much faster than 20mph.